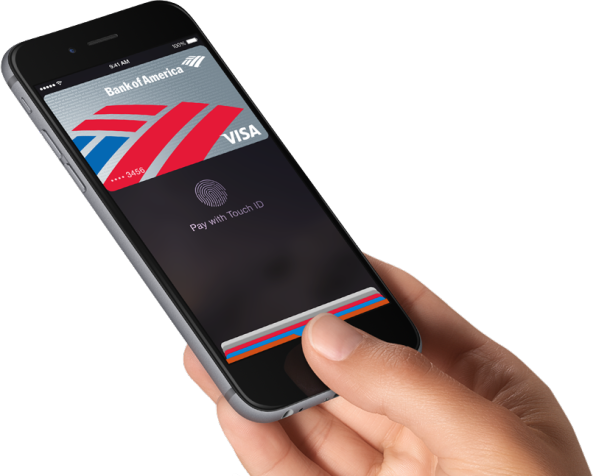 Apple Pay is a contactless payment platform that is newly available to iPhone 6 users. It works well and is incredibly simple; once you’ve added a card to Apple Pay, you just need to wave your iPhone over an Apple Pay compatible NFC payment terminal to pay for whatever you’re buying. The iPhones built-in TouchID sensor serves as an ID mechanism to prevent unauthorized usage, and you never need to pull out a credit or debit card after its configured. And yes, it really works that well once you have it setup, and that’s what we’re going to cover here. To use Apple Pay, you’ll need at least iOS 8.1 or later on a an iPhone at least as new or newer than iPhone 6 or iPhone 6 Plus (the newest iPhone models have NFC payment chips, older models do not), and an Apple Pay compatible credit or debit card. 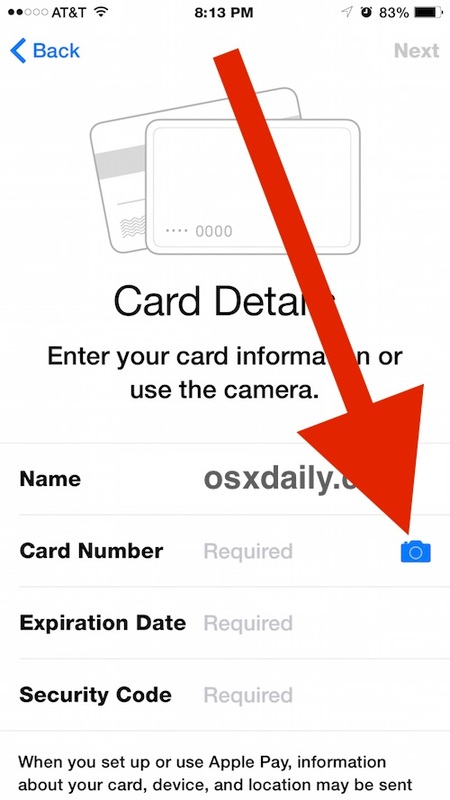 Note that you only need the card once for setup purposes, after that you can leave it behind. 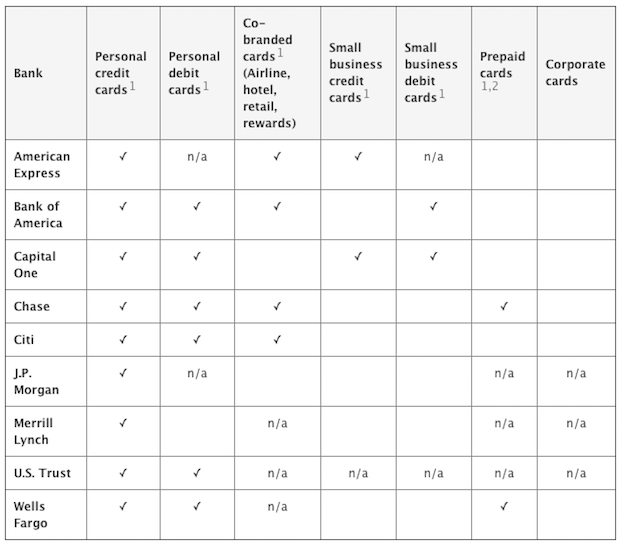 Supported cards vary but Apple is maintaining a list of banks and bankcards that support the feature, the list further below is current as of now but is sure to change as more banks add additional card support. For now, let’s get on with setting up and adding cards to Apple Pay on iPhone. The setup is really quite simple, if you feel like it you can go through the process again to add another card or several cards to Apple Pay. At the moment there appears to be an 8 card limit, so plastic jugglers may need to prioritize which cards they want to add to their iPhone. Each card gets added to Passbook and you can toggle between them during payment if you want to use one rewards card over another. So how about the payment side of things? 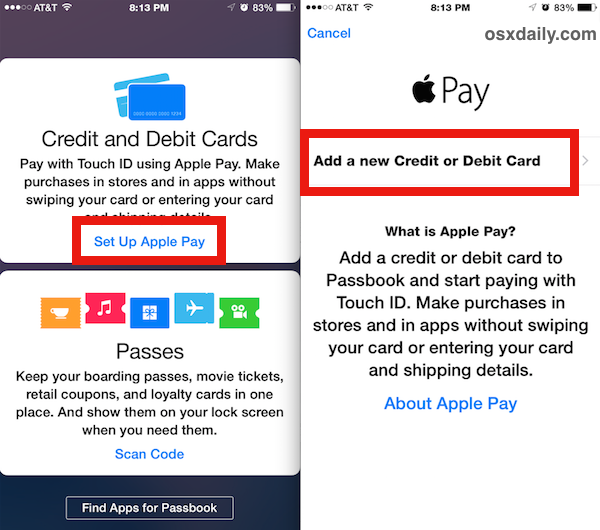 Paying with Apple Pay is a piece of cake after you have it setup properly. 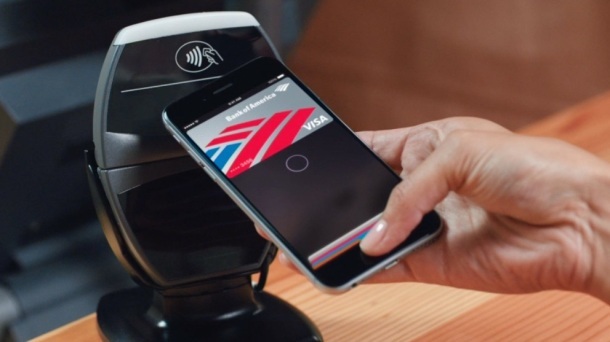 When it comes time to checkout, hover your iPhone over the NFC payment terminal, the iPhone will get a little alert indicating a payment is ready, then you just put your finger on Touch ID to complete the checkout. That’s it. No signing anything, no swiping anything, no handing over a piece of plastic. Support for Apple Pay is still rolling out across retailers, stores, and restaurants, but something like 200,000 stores currently support it already, and that number is likely to grow more rather quickly. 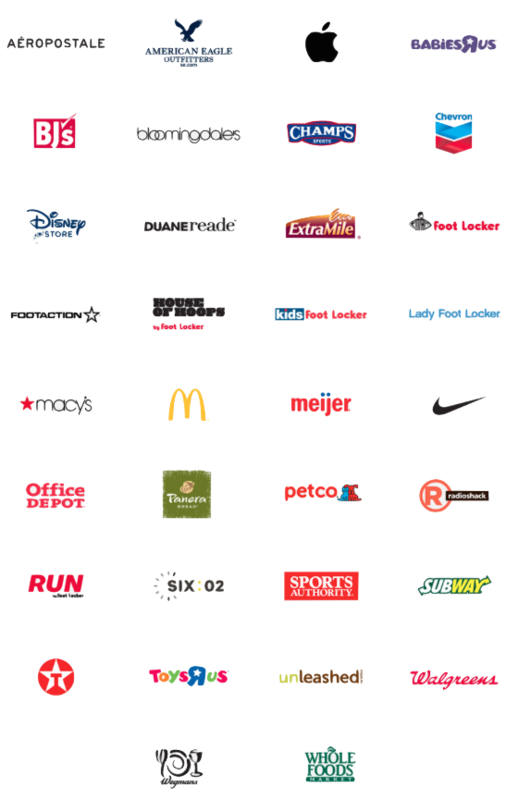 Much like the supported cards list, Apple is also maintaining a list of stores that allow usage of Apple Pay, at the moment it includes everything from Whole Foods, McDonalds, Macy’s, Bloomingdales, Nike, Texaco, Walgreens, Subway, Petco, Office Depot, Chevron, Toys R Us, the Apple Store, and quite a few more. Though Apple Pay is officially supported in the USA at the moment, multiple reports have indicated that Apple Pay is usable right now outside of the USA in a variety of countries, including the UK, Australia, UAE, and Canada, if the card is issued with US credentials. If you have a compatible card and a new iPhone, take the time to set up Apple Pay, it’s pretty nifty and feels a bit like the future. And speaking of the future, you are als able to use the Apple Watch for making payments this way too. I’m going to sign up for Apple Pay with my Wells Fargo card to get the $20 because it’s $20, but honestly I don’t see how this is more convenient than using a credit card. Am I out of touch? pay by getting out your iPhone (6 or 6+), simply use touch ID to pay, done, no need to get out your card, swipe press a bunch of buttons, sign etc. etc. Apple Pay is a secure payment system, whereas magnetic stripe credit cards are totally NON-secure. No one can hack (i.e. Target’s) POS system and get your Apple Pay information and use it to pay for anything, if they are able to get anything it will be a number that is not your card number, but they can’t do anything with it, your name is not there, it’s just a number, everything is done securely. (Abbreviated description). In order to receive the credit for this. an  Pay transaction with the Wells Fargo credit/debit card must be made. Credit earned through this offer will be applied as a statement credit to the primary Wells Fargo checking account linked to your debit card within 45 days following your qualifying Apple Pay purchase. This promotional period runs through November 30, 2014. This offer is not transferable. Statement credit is limited to one $10 credit per customer during the promotional period. My passbook doesn’t look like this…I don’t see any “set up Apple Pay” option, just the “look for apps”screen shown above. What is wrong? You either don’t have an iPhone 6 or newer, don’t have iOS 8.1 or newer, or aren’t in the USA. Those are the Apple Pay requirements at the moment. I really don’t want another CC from an approved bank, I have too many as it is. I’ll wait until my local bank approves their card.